Today I went to Toronto with my family for a Steven Curtis Chapman concert. Originally one of the couples that supports me was going to go to the concert with my parents but after they bought their tickets they forgot that they already had plans to go on vacation to Cuba so my brother and I went instead. It was a nice treat to be treated to a concert while I’m home and it was great to have my brother Jonathan with us too. 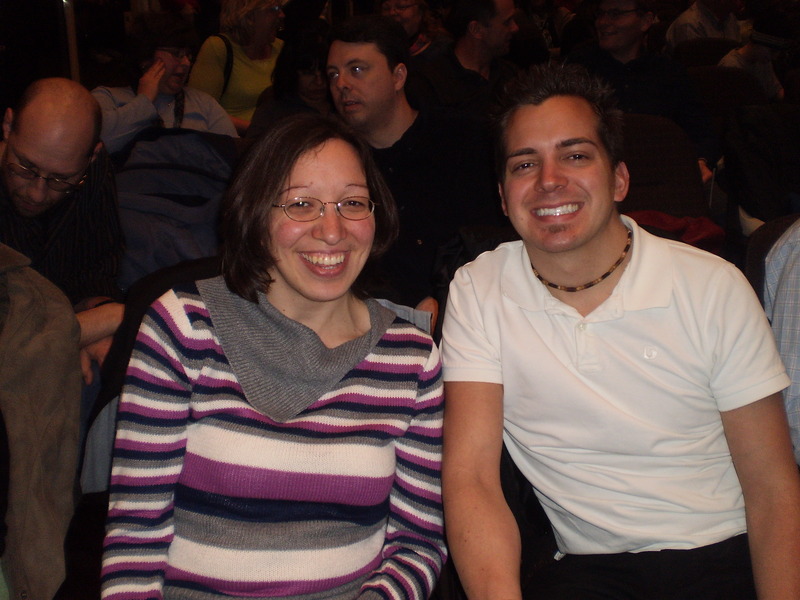 My brother Jonathan and I at the concert. The concert was really great. It was held at Queensway Cathedral church and it was packed. I was quite surprised how long the concert was and I think it was the longest one I have been to in a long time. It started at 7:00pm and ended around 10:00pm. One of Steven Curtis Chapman sons now has his own band. The Caleb band opened up for his Dad and also Geoff Moore performed too throughout the evening. It breaks my heart though that one of Steven Curtis Chapman’s adoptive daughters died. I can tell his family is still going through the grief of that but I can also see how God has strengthened them through this too. One of the things that Caleb shared during the time they opened up for his Dad really challenged me and so I’d like to write about it here so I don’t forget it. He told us that God showed him a picture of his family standing up very close to a canvas painting just after his adoptive sister died. He told us when they were right up close to the canvas painting it was very fuzzy and they could not make out what the painting was because they were too close. However when they started taking steps back they were able to see the canvas painting more clearly. When Caleb shared about the canvas painting God really spoke to me about that. It spoke to me a lot because it totally made sense! It is God who sees the big picture of our lives and usually we can only see a little spot of the big picture at certain moments in our lives. Especially during this time in my life right now. I honestly do not understand what’s happening in my life right now of why I am in the situation that I am currently in however I believe God knows the big picture and He has everything under control. I need to step back, learn to give up my control, let go and totally trust in God. God knows how my life will be laid out because He is the one who has given me life and has given me this destiny to serve Him as a missionary in Romania. What a revelation God has given me and now I just need to apply it to my life right now! What a great concert and I was also amazed how incredibly talented Steven Curtis Chapman’s sons are too. I am so grateful God has given me this opportunity to spend time with my family and go to this concert!